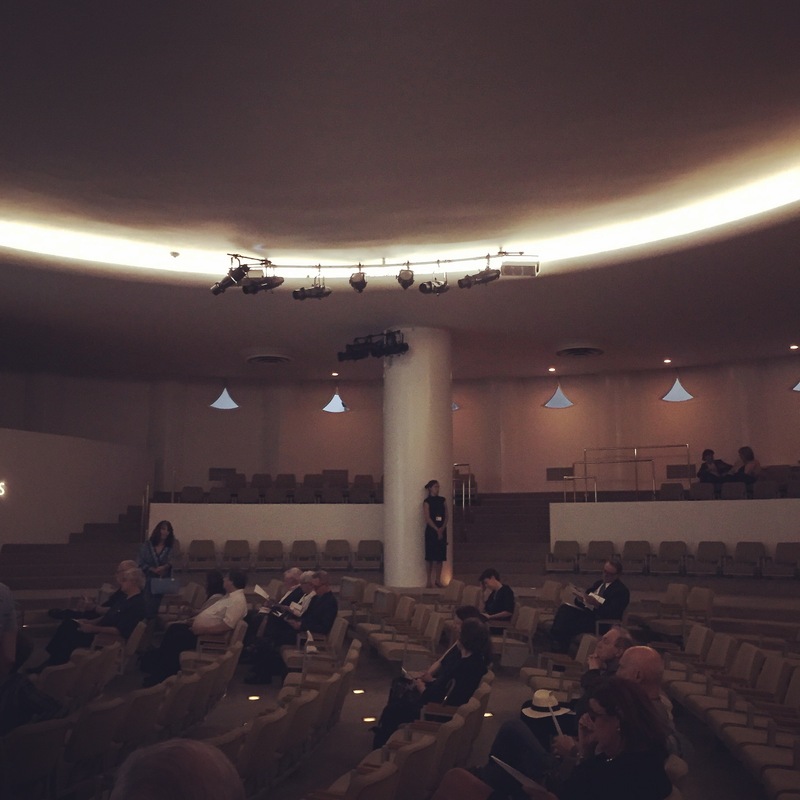 sitting in the Peter B. Lewis Theater underdeath the Guggenheim museum – only difference was I wasn’t buzzing around anyone’s head. That would have been weird. I was a well behaved flea who didn’t get in anyone’s ointment or march defyantly around the rim of anyone’s coctkail glass. I’m taking the metaphore too far…I am not a flea, I am a human being and if there is any great difference, truly, between a flea and a human being it’s that I make meaning of things where the flea does not. In fact I am unable to not make things mean things but that’s a story for another day. So there I was, a virtual flea, listening to giants discuss the creation of a new opera, Breaking the Waves, that premieres at Opera Philadelphia next week. I paid the equvalent of a good seat in the Family Circle at The Metropolitan Opera on a Saturday night to listen to a select number of chamber pieces – performed by the amazing lead cast & musicians – and hear the composer, librettist, conductor and director discuss their process. Why would I do such a thing? Wouldn’t the value have been in networking like crazy and leave with at least one good contact? That is what a flea would have done. That is not why I was there. At another time I will do that, probably yes, but this was the beginning of a grand adventure that I’ve been working my way towards for the better part of five years. Attending the Works and Process event made manifest (even for just a tiny fraction of a moment) what I have been saying I want…to be a librettist and be part of the modern opera movement. I did have one interaction with a person-of-note (nobody mentioned here thus far) that didn’t go so well. We chatted a bit and when she asked me what I was doing there I blurted out “I want to be doing what they’re doing!” pointing at the stage filled with empty chairs and music stands. She quickly ended our conversation and I sat in my seat feeling the sting of having been swatted out of the way. I deserved it. Did I show up to this most intimate of opera events unprepared? Well, yes I did. I went in there with one intention; to fully immerse myself in the Society of Amazing Peole who Produce Opera for a Living. SAPPOL – and damit that’s exactly what I did! Back to giants and idols: Being Jewish, I have learned that idols are bad, bad things to be shunned and avoided at all cost. I can and do ascribe to the principle that bowing down to a piece of brightly painted clay begging for salvation, or a new job, is something rediculus and potentially damaging. But then I went to the dictionary to broaden my meaning of the word. So breaking it down, an idol is basically a mental image or a physical shape or form worth one’s time to comment on. An idol stands out, an idol is attractive, an idol is – ultimately – unrealistic. So if I want to be doing what Royce Vavrik is doing, for example, and doing it in my own way and at my own pace then his status as an idol really morphs more into that of a model, a suggestion of what I could be some day. I admire the work he does as a librettist and I know he puts one foot in front of the other as he walks down the street. He just happens to be WAY further down the street than I am. I feel as though I keep starting even though each foray I take into the world of opera seems to bring me ever closer to the vision I have; perhaps there is nothing but starting from wherever I happen to be right now…hmmmm. What’s my point here? So inspired as I was after Monday night I went back to investigating Master’s Degree programs in musical theatre. NYU being the logical place to look (‘cause that’s where Royce Vavrik went…probably when he was 25!) I got all excited all over again reading all about the program, how they put composition students together with playwriting students – colleges are starting to catch on about this medium called Opera – and then I read “applicants must be full-time students.” And I stopped. Here I am, 52 years old now, working a full time job ‘cause I have to, ready and so able to take this program on with more gusto and passion then I ever had as a 25 year old and I simply cannot fit my square-self into the NYU round hole: what I am is more of a hexagon, really. And so, this realization brings me back to the idea I launched at the beginning of this year – to make my own course of study and stick to that course building my vision block by block by block. The Mott Academy of Writing Librettos fall semester has officially started! Ps. When I make it across the pond one of these days to visit family in Chichester I will make a point of dropping in on a coffee house near Dorset named Amid Giants & Idols.